tech. issue 14 - grab it from iTunes now! This week's issue of tech. magazine is all about what the mobile world has on offer in 2013. With Mobile World Congress all wrapped up, tech. rounds up all the essential phone and tablet news, revealing the 10 best things at the show as well as interactive previews of the must-have products – including the Samsung Galaxy Note 8.0 and Asus Padfone Infinity. Plus, there's essential information on Google Glass, Google's Chromebook Pixel is pitted against the MacBook Pro Retina and an explanation as to what Spotify is doing with Ford. "Mobile World Congress is the biggest event in the mobile calendar and while many of the big players decided to announce key products elsewhere, there was still plenty to get excited about and you can find it all in tech.," said James Stables, Associate Editor of tech. magazine. 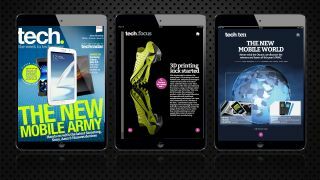 Grab the latest issue of tech. from iTunes now. And don't forget that you can still get five issues free.